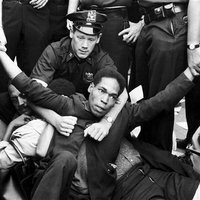 This is a July 10, 1963 photo of Brooklyn CORE member MIneral Bramletter being arrested at the SUNY Downstate Medical Center demonstration. Brooklyn CORE initiated this demonstration as part of a city wide CORE campaign protesting the lack of Blacks and Latinos in the construction industry. Bramletter was arrested as part of a group trying to block a cement truck from entering the construction site. He also participated in the Route 40 Freedom Rides. note: this photo was taken by Robert Greger whose wife was Brooklyn CORE member Laura Greger. My thanks to Dr. Michael Greger for pointing this out to me. Robert L. Greger, “photo of Mineral Bramletter, Brooklyn CORE,” corenyc.org, accessed April 21, 2019, http://www.corenyc.org/omeka/items/show/150.